Your financial success starts HERE. 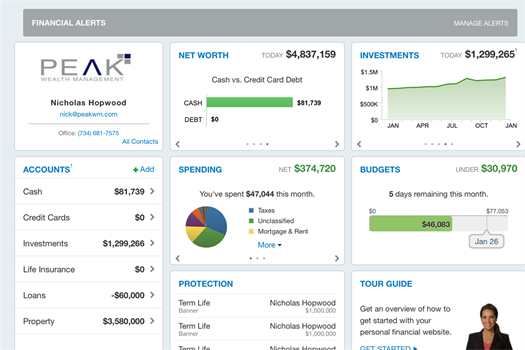 Plan with Peak is your complete financial portal. It is our financial planning tool which helps us to understand where you stand relative to your goals. We can run various "What-if?" scenarios to stress-test your financial future, as well as aggregate all your financial accounts so we can monitor daily progress and even track your net worth while sitting at a red light. The answers you need, wherever you are. Work with your CFP® at Peak Wealth and create a financial plan to achieve your goals - click here to get started! Your Comprehensive Dashboard. Access your net worth, investments, or budget 24/7 online or on your mobile device. What if I become disabled or pass-away? Will my family be protected? 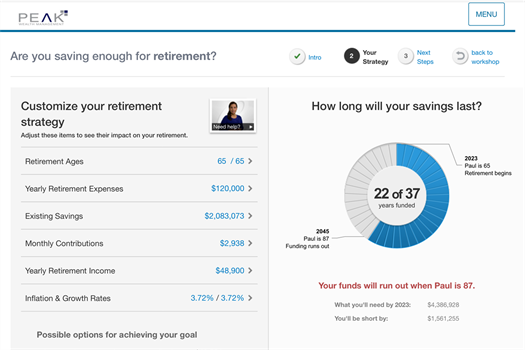 Do I need to save more in order to reach my retirement goals? Will my family owe Estate Taxes when I pass-away? 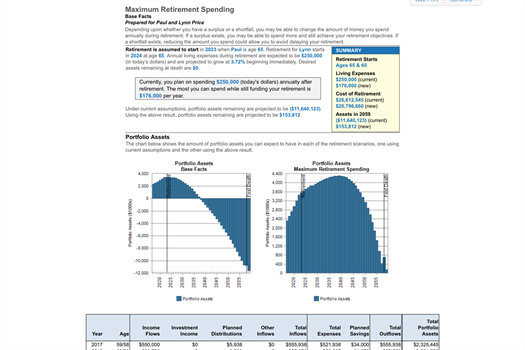 What is your maximum retirement spending? This chart illustrates that the client is NOT on track to reach their goals. By running this simple report, we can see what level of retirement spending they are currently on track to reach.